Daily Mirror - Why is this anti-India demagoguery? Why is this anti-India demagoguery? Though Ranke’s idea was questioned lately, the basic conception of a state’s foreign policy being driven by its external needs often at the expense of domestic considerations, remains influential. For instance, modern day neo-realists, the dominant school of international relations theory follow the same intellectual tradition. They do not dispute the existence of competing imperatives at the domestic level, but argue that external forces would overpower domestic factors. "Mass- political mobilization that influences state policy and elects governments take place solely in Sinhala and Tamil"
Modern day commonsensical politicians though take this with a pinch of salt. There are two main reasons. One is the virulence of systemic forces (or the anarchy itself) in the international system have lessened thanks to global institutions and globalization. Today few countries face a realistic threat of losing sovereignty or being swallowed up by a powerful state- because retributive cost of such an adventure is heavier than in 19th century Europe. Second, with the spread of democracy and universal suffrage, and now the emergence of a new form of mass politics and proliferation of social media, few politicians could insulate himself from societal pressure without losing the next election. Some of the most pivotal events in recent months, from Donald Trump’s abandonment of Trans Pacific Partnership (TPP), which was part of Obama administration’s pivot to Asia to check China and chaos in the EU and Brexit , paradoxically in the wake of an increasingly troublesome Russia, can only be explained by the function of those domestic factors which have overwhelmed milder systemic imperatives. "Modern day neo-realists, the dominant school of international relations theory follow the same intellectual tradition"
The plus point of the era of mass politics is that foreign policy is no longer a monopoly of the government, when it risked being manipulated by a cabal of elites to advance their interests. The downside of this changing status quo are charlatans – such as the likes of Wimal Weerawansa who asked the public to hoist black flags to protest Modi’s visit and self-interested political pundits doing a hack job for a disgruntled joint opposition - could sway public opinion, often against the very public interest. This dynamic was manifest during and after the Indian prime minister’s visit. Sri Lanka’s self-interest in fostering a greater connectivity with India, especially at a time the Indian economy is growing more than seven per cent and Sri Lanka is looking for investment and technology is self-evident. Infusion of Indian investment is felt more than ever as the government here is going through a period of fiscal consolidating, cutting down on state-led infrastructure development, which was a key driver of economic growth under the former regime. A greater confluence of Indian and Sri Lankan interests would also make India less suspicious of the Chinese economic presence in the island. The objective here is not to reiterate those reasoning -- which have already been dealt with in detail by many others in this newspaper and elsewhere -- but to highlight the troublesome potential of this anti-India demagoguery. 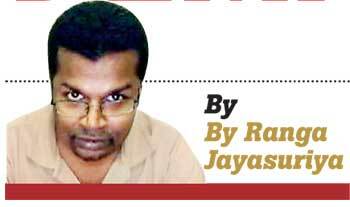 Leave aside politicians, who generally make their statements driven by party-political considerations, and the party stooges who may be eyeing a foreign ministry post in a future Rajapaksa government. There is a third group, who deserves a sympathetic hearing: They are the old school bureaucrats, business leaders, nonpartisan academics, all nice people, who have however failed to shed their ambivalence, (if not contempt) to old India of its Hindu growth rate. Their failure to keep up with the change is due to their insulation from a fast- changing wider world. They have thrived in their insular little cocoons and want this country to remain the same. They may have brilliant minds, but a closer look at the successful states would reveal, more than the intellectual brilliance, it is the right ideological disposition and a dose of pragmatism that were at the root of success. Otherwise, our SWRD, N.M, Colvin and India’s Nehru and Krishna Mennon were world class intellectuals, but they were also shackled to their ideological dogmas and deprived their countries an early opportunity of economic take-off. All in all, the current sorry status quo is a pointer to the penury of our intelligentsia. But that may not be the worst of the problems. In an increasingly inter-connected world, Sri Lanka could well ‘import’ the top rung of its intelligentsia as long as a forward looking government centralize its policy priorities; and that the country develops a labour force that can easily absorb new technology and global capital. The real danger however is when this demagoguery spewed in vernacular reach the public. In an era of proliferation of information, average public is bombarded with too much information and misinformation that they cannot easily distinguish between the two. It was argued the recent Brexit vote was swung by misinformation; such as inflated figures of British payment to the EU, the number of immigrants, and hearsay on a Turkish entry to the EU etc. The Sri Lankan electorate is far more vulnerable.Anti-India demagoguery is aimed at them. In the absence of the government pre-emptively and pro-actively countering that narrative, the public would be swayed by misinformation. On that count, vernacular press too has a role. Companies may conduct hiring interviews and NGOs would churn out reports in English, but English is no longer the language that matters in politics. Mass- political mobilization that influences state policy and elects governments take place solely in Sinhala and Tamil. English media too count very little except as a ready source for embassy staffs write reports to their missions. However, the Sinhala media has remained an onlooker rather than a proactive agent of this change. (Tamil media is mired in its North centric-ethnic politics.) Their inability to infuse a fresh thinking to the public is troubling. If nothing else, it would be in the interest of media to play an enhanced role for even to sell more copies, a country should have more opportunities. In the long run, though, the solution lies in reforming our antiquated education system. Our education system is a great equalizer, but for some reasons it has failed to keep up with the change. Our schools should prioritize on teaching Science, Technology and Mathematics, (plus English). In addition, we need a curriculum that provides children with a more nuanced world view, a wider political and economic outlook. A comparative politics, economics, current affairs course, that would not only introduce various systems, but would also explain why some having promised of an equalitarian paradise, reigned over mass murder, gulags and economic stagnation, would help fill that void. When we were in school there was a subject called social studies, which was envisaged to offer some exposure to the world, but instead it had a syllabus that made students parrot which king built which tank in Anuradhapura and Polonnaruwa. That is not the kind of knowledge that helps students to succeed. The antiquated and often intolerant student politics in our universities are a reflection of that failure. If Sri Lanka fails to fix this mess, even without another war, we will blow away another chance of economic take off. Sri Lanka should be thankful towards India for just ONE thing and that is for giving us their Greatest Son, The Lord Gautama Buddha.If Sri Lankan Buddhists undestand thi sthey would never hold this jealous grudge against the Indians because that is not what the Lord Buddha preached.